Battle of the big phones - which phablet it best? The Samsung Galaxy Note 7 is finally back after a two-year break from the UK. Samsung has skipped the Note 6 in order to bring the Note range in line with the flagship Galaxy S range. But you can read our news story for all the information - you came here for a phablet deathmatch. Is the Note 7 any good? 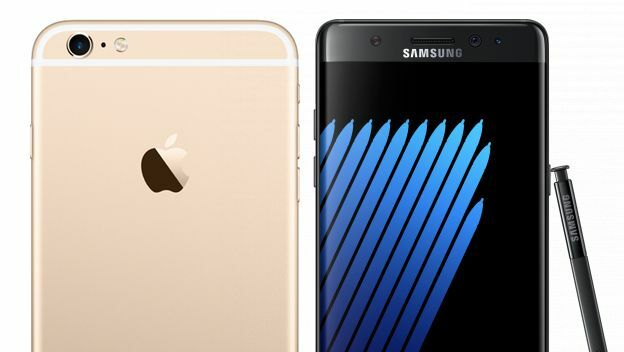 Let's put it up against two of its key rivals, the iPhone 6S Plus and Huawei Mate 8, to find out. To make deciding which is best more simple, I've assigned each phone a highly scientific and completely arbitrary score from 1 (the worst) to 100 (the best). Always a contentious topic, highly subjective, which phablet has the best design? All of these phones are massive. The Huawei is the largest, measuring in at 157.1 x 80.6 x 7.9 mm. This is because it has the largest screen, at 6-inches. The iPhone is a close second, measuring 158.2 x 77.9 x 7.3 mm. This is surprising, as it actually has the smallest screen, only 5.5-inches. The smallest smartphone here is the Note 7, which is a dinky 153.5 x 73.9 x 7.9 mm. That's smaller than the iPhone, but manages to include a larger screen (5.7-inches) thanks to the small bezels and edge display. Of course, size isn't everything. We think the iPhone 6S Plus looks the best with its sleek and stylish lines. Followed by the Note 7 which is functional, but still slightly fussy. The Huawei comes in last - it's fine, but lacks finesse. Phablets are mainly purchased for their large displays. First let's look at size. If you're after the biggest display here - the Huawei has the largest at 6-inches. This is followed by the Samsung at 5.7-inches, with the iPhone trailing at 5.5-inches. In terms of screen technology, the Samsung Note 7 is the clear winner. With a Super AMOLED display and QHD resolution, it's simply one of the best displays on the market. It has a pixel density of 518 PPI. It comes with the S Pen - a stylus which makes working on the device easier. The iPhone 6S Plus has the second best display. The ISP LCD panel is bright and vibrant, with a pixel density of 401 PPI. It also has 3D Touch, but won't work with a stylus. While the Mate 8's display is perfectly acceptable, the Chinese phone the weakest here. With the same HD resolution as the iPhone, but stretched over an extra 0.5-inches, it only has a PPI of 368. All of these phones are fast, and you wouldn't be disappointed with any of them. But there is one clear winner, and that's the Samsung. The Samsung Note 7 is a hugely powerful phone, with 4GB of RAM and a Samsung-made Exynos 8890 octa-core processor. It comes with 64GB internal storage, which can be expanded with a MicroSD card. The iPhone comes with 16, 64, or 128GB of internal storage, which can't be expanded. So it's not ideal for power users. Similar to the Samsung, the Huawei packs an octa core processor (Kirin 950) and 4GB RAM. It comes with 64GB of storage, which can be expanded. I can tell you, in everyday use, performance is pretty equal across all phones, but the Samsung is an absolute powerhouse, and features expandable storage, which is a big bonus. Big phones have space for bigger batteries. The Huawei is the clear winner here, with a massive 4000mAh battery. This is followed by the Samsung which packs a 3500mAh cell, and then the iPhone, which has a small 2750mAh battery. The iPhone 6S has a new 12MP rear camera with support for 4K video and animated Live Photos, as well as a 5MP front-facing snapper. It's the simplest camera to use in this test, and will pretty much always give pleasing results. The Samsung Note 7 makes use of the same, excellent camera unit as the S7. It's a 12MP sensor, capable of taking stunning images in most conditions, it's nothing short of spectacular. The Huawei has a 16MP sensor. It's a good camera, but not a stand out feature. The iPhone 6S runs iOS 9, which is just like iOS 8, but with improvements to Apple Maps, genuinely useful updates to Siri and a lot more. It should be familiar to Apple fans but it looks like it will be the best version of iOS yet. The Samsung Note 7 and Huawei run Android Lollipop, which is a pretty slick and polished OS itself, but they all have their own looks and themes, making them feel a little different. We prefer Samsung TouchWiz skin to Huawei's EMUI. The iPhone also TouchID fingerprint sensor, and of course, it's the only phone on this list to run iOS, which a lot of people prefer over Android. The Samsung Galaxy S7 benefits from a Touch ID-rivalling fingerprint scanner, water and dust proof casing, expandable memory, and, brand new iris scanner security. The Huawei has a fingerprint sensor, and fast charging. What can we draw from this very accurate and methodical test? It's clear the Samsung Galaxy Note 7 is the best large smartphone you can buy. It has a great screen, leading specs and an outstanding camera. The iPhone is a very worthy contender, we prefer the design, and think iOS is more intuitive. But it simply can't match the Samsung in a few key areas. The Huawei came in last, but it's still a good phone, especially if you value battery life and screen size above all else. It's also the cheapest on test.